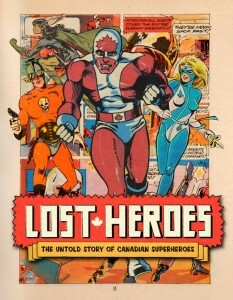 SF Canada member Mark Shainblum is one of several Canadian comic book creators featured and interviewed in the new documentary Lost Heroes: The Untold Story of Canadian Superheroes, produced and directed by Wil Pascoe. In collaboration with comic artist Gabriel Morrissette, Shainblum wrote and co-created the Canadian superhero comic Northguard and the political humour series Angloman. He also worked on the classic Canadian comic book hero Captain Canuck and the weekly webcomic Canadiana. Shainblum is also an award-winning science fiction and fantasy writer and editor, and served as president of SF Canada in 2002-03. Lost Heroes explores the hidden history of Canada’s comic book superheroes. From Canada’s Golden Age when millions of children read the tales of Inuit goddess Nelvana of the Northern Lights, to the thrilling days when Canadian heroes returned to the newsstands and comicshops with characters like Captain Canuck and Cerebus, Lost Heroes celebrates the unique Canadian talent behind these characters and asks why can’t Canada keep its heroes? Lost Heroes is a Middle Child Films / Farpoint Films production, and airs throughout March, 2014 on the Canadian cable channel Superchannel. It also has theatrical showings in Toronto, Winnipeg and at the Emerald City Comic-Con in Seattle. Mark Shainblum is a Ottawa-based science fiction, fantasy and comic book writer. His prose fiction has appeared in magazines like On Spec, Would That It Were, Thousand Faces and the anthology Island Dreams: Montreal Writers of the Fantastic. In 1997 Mark and John Dupuis co-edited the Aurora Award-winning alternate history book Arrowdeams: An Anthology of Alternate Canadas, published by Signature Editions. In comics Mark wrote adaptations of Michael Moorcock's classic Corum novels for First Comics in collaboration with Ken Hooper and Jill Thompson, and also wrote and co-created the critically acclaimed independent superhero series Northguard with Gabriel Morrissette. In a slightly different comics domain, Mark is well-known in Canada as the co-creator of Angloman, a political parody series first published by Signature Editions in two bestselling books. Angloman later appeared as a weekly comic strip in the Montreal Gazette. Mark has also worked as a literary columnist, a technology journalist and a media relations officer for a major Canadian university. In the real world, Mark is husband to Andrea, and daddy to Maya.